A video monitor is one of those baby items that's not a necessity, but it also prompts thoughts of How did I ever live without this? once you have one! The highly-rated Summer Infant Day & Night handheld color video monitor in silver is priced at $112.99 on Amazon right now. that's 37% off the list price of $179.99! Super Saver shipping is free on this item. 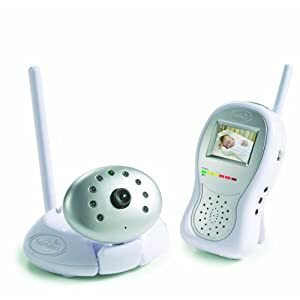 Do you have a video baby monitor? If you do, do you recommend it? We have this one (got as a gift!) and we love it! No complaints, have a three month old. We’ve been using this for 2 years, LOVE IT. We JUST bought this same one from Babies R Us for $179.99 last weekend and LOVE it!! Our bedroom is on the main level but our son sleeps upstairs and it’s so nice to be able to “look in” on him whenever we want to without going all the way upstairs and possibly disturbing him. Thanks so much for posting this deal! I just bought the one from Amazon and the BRU one is going back as soon as it arrives!! It’s so great to hear your feedback on this monitor! The reviews are good, but I want to hear it from moms I know! we love this monitor! we have one that we have been using for 2 years for our daughter and we are not ready to take it out of her room yet for baby boy, who will be arriving in june, so we are getting another one. its also nice because it has 2 channels and we can see both kids on the same monitor just by switching channels. thanks for the heads-up on the discount…i will definitely be taking advantage! I just got this monitor (that I had been eyeing for sometime) since it went on sale a few weeks ago at Amazon. It’s need up in my 22mth olds room for four days and already I’m not sure how we lived without it!! Clear picture, clear sound, love it. Must have and at this price, you shouldn’t pass this up!